Wittenborg University of Applied Sciences was established in 1987 and is situated in Apeldoorn. With a focus on 5 key themes, “Management, Internationalisation, Diversity, Sustainability, & Innovation”, Wittenborg is one of the fastest growing independent international university of applied sciences in the Netherlands. With around 600 students from more than 80 different countries studying on its bachelor's and master's programmes in two schools, the School of Business and the School of Hospitality & Tourism. In its 10-year plan, presented in 2013, Wittenborg is aiming at growing to a broad university with a total of 5 schools. The new schools that are under the development are the School of Arts & Technology, School of Health & Social Care, and School of Education. Wittenborg is determined to provide cross-discipline & applied-science education to assure its graduates are more suited for the future job market, within an international context. With a clearly defined mission and philosophy, Wittenborg University offers excellent education in business studies to students from the Netherlands, Europe, and around the world, ranging from school leavers to people with professional experience and previous study qualifications. Through its developing research centre, focusing on the 5 key themes, Wittenborg University enables applied research to be embedded throughout its programmes. Wittenborg University is staffed by a closely knit, international team of professional people dedicated to excellence in business and entrepreneurship. The degree programmes are all offered completely in English. In fact, with staff from more than 20 different countries and cultures, English is the lingua franca at Wittenborg! The School of Business and the School of Hospitality and Tourism offer programmes in fields such as Entrepreneurship and Marketing & Communication, as well as Hospitality Management, Finance, and Economics. The IBA specialisations also include Real Estate Management, Information Management and Logistics & International Trade. Furthermore, Wittenborg offers business-to-business training packages to companies across Europe, the Middle-East, and Far East in English and German, together with a local language trainer. Bachelor Programmes: The unique, business-like curriculum is offered in 3 phases, over 3 years in blocks of six weeks, by a team of international professionals - from over 10 countries - in management, business, entrepreneurship and social sciences. Because of the fact that our lecturers are also mostly active in the business world, our students are prepared for their future careers in an effective and fruitful manner. MBA & Master of Science: The Master of Science programmes are offered jointly with the UK University of Brighton and fully taught in Apeldoorn by professors from both Brighton and Wittenborg Universities. Students can complete the full-time programme in 1 or 2 years and study the MSc degrees part-time in up to 6 years. Currently, Wittenborg offers MSc degree programmes in the fields of Hospitality, Tourism and International Event Management. From 2014, a full-time and part-time MBA programme is offered in General Management, Entrepreneurship & Innovation and Hospitality Management. Foundation & Pre-Master's: Wittenborg offers foundation programmes and IELTS courses to both its bachelor's and master's students as well as students from other institutes. 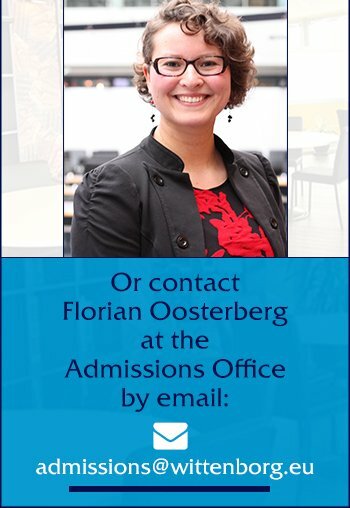 Contact us now for more information on the 6 enrolment and graduation dates per year, specialisations, finishing your bachelor's and master's studies in 4 years, and more, or browse the Intranet (Wittenborg Online) to get a better feel of the way this unique university of applied sciences works!